Enjoy visiting here on a daily basis!!! Please add this to your Favorites!!! On this site you will find everything about our favorite star, including photos of Roy & Dale, a biography, an annotated list of films, breaking news, and more surprises yet to come! Be sure to sign our Guest Book below. so please, check back often. This beautiful Photo contributed by Artist Sharlene! It's now owned by the Rogers family. which can be found on the LINKS page. 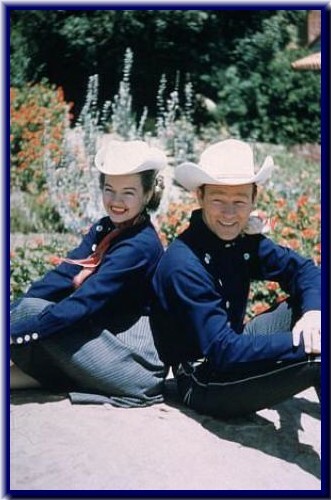 To JOIN the Roy Rogers Dale Evans Messageboard please click here. It's FREE! Copyright 2004 *All rights reserved. Reproduction in whole or in part in any form or medium without express written permission of Painted Pony is prohibited. Cherokee Flats*The Happy Trails Highway*Happy Trails Roy & Dale are trademarks of the Original Painted Pony. 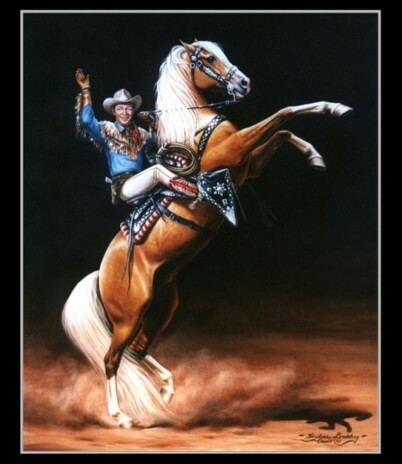 Graphics of Roy Rogers, Dale Evans, Trigger, Buttermilk and Bullet are trademarks of Roy Rogers, the Official Roy Rogers & Dale Evans Web Site and are used by Painted Pony with Permission. Has it got your brand on it Partner?